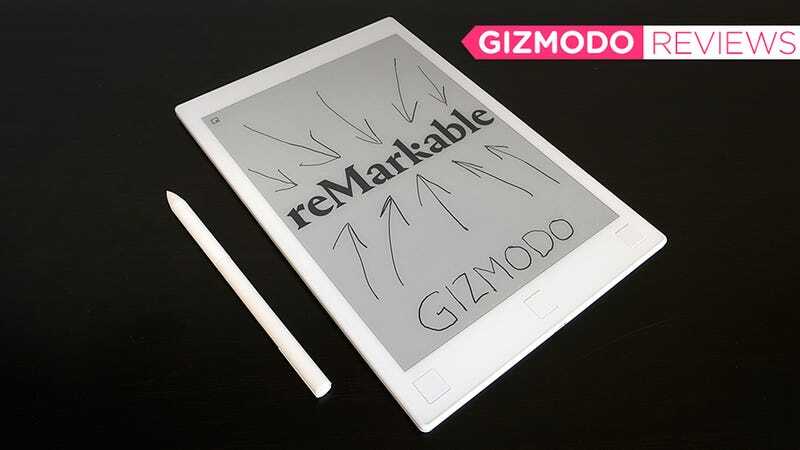 An E Ink tablet that's more fun to write on than paper. The smooth feel of the stylus moving across the E Ink display. That price, and some frustrating software choices. The same e-ink technology used by devices like the Kindle to authentically emulate the look of paper can now be used to emulate the feel of paper. The reMarkable tablet combines an E Ink display and Wacom’s much loved stylus technology to create a device that can replace all of your notebooks—if you can live with some software shortcomings, and an insane price tag. 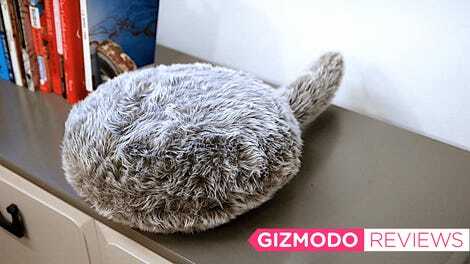 This thing costs $600—which is more than any iPad, and just $50 cheaper than an iPad Pro. So how can a tablet with limited applications and a grayscale display be worth that price? For me it’s because the reMarkable tablet’s writing surface is a night and day experience to writing on the smooth glass of an iPad. Its E Ink display is protected by a layer of finely textured acrylic glass that’s not only durable and scratch proof, it also feels like paper as you scribble away with its battery-free stylus. The experience is as close as I’ve ever come to digitally replicating paper, and after spending a lot more time with the tablet, it’s already replaced most of the pens and paper on my desk. The iPad might have failed to kill off e-ink devices, but the reMarkable tablet definitely has the potential to make paper notebooks obsolete. In the right circumstances, the pen on paper feel of the reMarkable tablet is absolutely perfect. When doodling, sketching, or writing in cursive, there is no noticeable lag between your physical pen strokes and what appears on screen. Unfortunately, I can barely remember how to write in cursive, and I’ve found that my preferred style of all-caps printing penmanship (if you can even call it that) seems to tax the reMarkable tablet’s 1GHz ARM A9 processor. The stylus’ lag is only apparent when you’re printing, when writing, scribbling, or sketching, the digital pen on paper experience is flawless. To facilitate a robust undo feature, the tablet tracks every stroke you make as soon as you lift the stylus off the screen. Writing in cursive, where the letters are all connected, results in long strokes with the stylus only occasionally being lifted. But printing results in countless tiny strokes for each letter, and as the reMarkable tablet works to log them all, it results in a tiny bit of lag that unfortunately takes away from an otherwise magnificent writing experience. Hopefully this can be improved through software updates, or a faster processor on future versions of the tablet, so that I can keep on printing like a grade schooler. An on-screen keyboard works well enough, but handwriting recognition would be a welcome addition to the tablet’s feature-set. That 1GHz processor (which is slower than the one the Kindle Oasis uses) and just 512Mb of RAM also results in boot-up times of about 15 seconds, the occasional sluggishness when loading larger files, and some unfortunately long waits when zooming in and out of a page full of notes and illustrations. There’s no doubt a faster processor would vastly improve this tablet. But the big problem with the reMarkable tablet isn’t the hardware. It’s the software. There are frustrating gaps in usability. As wonderful as the tablet is to write on, it lacks handwriting recognition. When you’re creating digital notebooks to fill with sketches and notes you will need to use an on-screen keyboard to name them, and then you can’t move pages in and out of notebooks once they’ve been created. These might seem like small problems, but they add up over time. Over time the tip on the reMarkable tablet’s stylus will wear down, but it comes with replacements, including an emergency backup inside the stylus itself. Other software issues are harder to see. The palm-rejection functionality is rock solid, ensuring you never make accidental screen presses while holding the tablet and writing, but it comes at the cost of not being able to flip through documents using finger swipes or taps. You’ll have to rely on the three hardware buttons below the display to navigate the pages of individual documents. It would be a travesty having an e-ink device as large as the reMarkable tablet and not be able to read ebooks, so the Wi-Fi-connected device works alongside a desktop client and a proprietary cloud service to wirelessly transfer PDF and epub files and even back up your own notes and doodles. The setup process is beyond easy (although you’ll need to create yet another online account) and files quickly show up in either the tablet’s pre-existing Documents (PDFs) or Ebooks (epubs) folder. You can annotate PDFs and epub files using the stylus, which could be a fantastic feature for students who’ve switched to digital textbooks. Disappointingly, ubiquitous image files like JPEGs and text files like DOCX aren’t supported yet, which is unfortunate because the reMarkable tablet also lets you annotate and mark up existing documents. It’s a great feature for editors, or students studying a textbook, but what isn’t great is annotating an epub file and then changing its display font or font size. The text will automatically adjust its flow and move around to fit the screen, but your annotations won’t, leaving them misplaced and out of context. At this point it certainly sounds like I deeply despise the reMarkable tablet, but that’s far from the truth. Do I wish it had a backlight of some sort so it was usable in a darkened theater during a press conference? Absolutely. 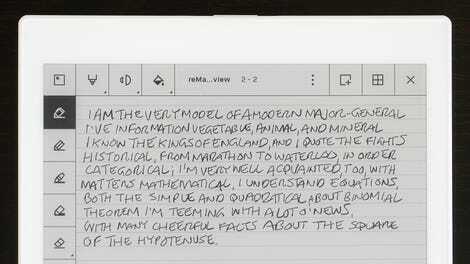 Do I wish it could convert handwriting to editable text, if even only through its accompanying desktop software or mobile apps? Of course! But there are also lots of things I really like about the tablet. Its 3,000 mAh battery lasts for days. When creating documents you can choose from a massive list of blank templates, including calendars, to to-do lists, grids, and storyboards. And even with a 10.3-inch screen that’s wonderfully spacious for reading, the tablet feels much lighter than an iPad, thanks to an aluminum back panel that also adds rigidity. A giant list of blank template pages will help keep your notes looking neat. At 10.3-inches, the reMarkable tablet has considerably more screen real estate than recent versions of the Amazon Kindle. The reMarkable tablet’s lock/power button. 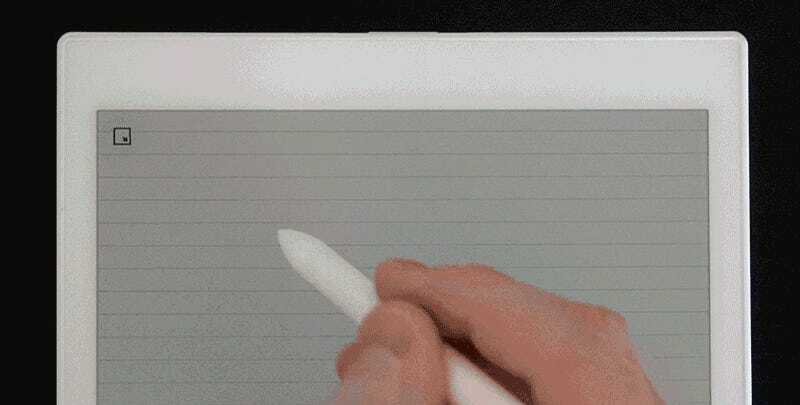 The tablet’s grayscale E Ink display limits your pen choices, but you can switch between a pencil, ink pen, marker, and highlighter, and adjust the stroke size. You can even move and rotate portions of the screen using selection boxes. The only case currently available for the reMarkable is this felt sleeve for an additional $80. My biggest problem with the reMarkable tablet is that I want all of its supporting functionality to be as excellent as its stylus is, but its software and UI just isn’t. However, the experience of writing on the reMarkable tablet is so fantastic that I’ve already started carrying it every day in lieu of a notebook, despite all the hoops I have to jump through to use the rest of its features. It’s really that good. What’s harder to accept than those software hiccups is the reMarkable tablet’s $600 price tag. That is incredibly steep for a touchscreen e-reader, even one with stylus support. It’s an expensive way to go paperless, and it will frustrate even those used to using bleeding edge technology. Unless you’re going through reams of notebooks every day you’re better off biding your time for a, hopefully, cheaper second-generation iteration of this tablet. The hardware is for a paperless future is finally here, now the software and price need to catch up. The pen on paper experience is perfectly recreated here. It’s the first stylus-based device that I can write on as fast as I can on paper, without having to wait for the screen to catch up. Although, certain penmanship styles do result in some frustrating screen lag. At $600 it’s expensive for a tablet with a grayscale screen, no apps, and very limited functionality. There’s just no getting around that. Battery-free Wacom stylus never needs charging. You can only import PDF and epub documents, but importing basic image files like JPEGs, or text docs, isn’t supported yet. What? Organizing and reorganizing files on the tablet is limited, with no ability to actually search for content. Pages in a document can only be turned using hardware buttons, swipes or screen edge taps won’t work thanks to the palm-rejection functionality. Currently only a single sleeve-style case is available, for an additional $80. A quick-access folio-style case would be more functional.